The Austin Marathon unveiled the revamped marathon course for marathoners and the entire world on Sunday, February 18th, showcasing the city of Austin throughout the entire FloTrack livestream. More than 15,000 participants registered for the Austin Marathon, half marathon, and 5K, coming to Austin from all 50 states and 35 countries. Tens of thousands of spectators lined the Austin streets cheering on runners, waving hilarious signs, and providing endless energy. The highlight of the day featured Allison Macsas qualifying for the 2020 Olympic Marathon Trials on the revamped marathon course, finishing in 2:43:11, in front of family and friends. FloTrack’s live coverage followed the men’s and women’s elite fields for the marathon and half marathon. The forecasted rain stayed away and start time temperatures hovered in the low 50s. Drizzle was on and off and low-hanging clouds helped keep race temperatures ideal for great times and hundreds of PRs. Aid stations hydrated runners with nuun performance, Clif Bar handed out Clif Shots at two Clif Zones on course, and runners celebrated with friends and family in the Oskar Blues beer garden at the finish line festival. Syracuse alumnus Joey Whelan (2:21:37) crossed the finish line first, besting 2017 Austin Marathon champion Joe Thorne’s time of 2:32:05. Craig Leon (2:23:24) and Daniel Bishop (2:26:27) rounded out the men’s marathon field, respectively. The male half marathoners finishing in the top three consisted of Patrick Smyth (1:04:16), Ryan Root (1:08:51), Luke Humphrey (1:08:54). Austinite Allison Macsas (2:43:11) shaved more than five minutes off her 2017 winning time. Ashley Paulson (2:46:11) and D’Ann Arthur (2:49:37) finished second and third respectively. The top three female half marathon finishers were Hillary Montgomery (1:16:15), Allison Mendez-Cleaver (1:16:19), and Jocelyn Todd (1:17:19). The Austin Marathon would like to thank the volunteers, spectators, and participants who made the race so special. They would also like to thank the City of Austin, Austin Police Department, Department of Public Safety, CapMetro, Travis County EMS, Under Armour, H-E-B, Under Armour, Clif Bar, nuun, Dole, Medicine in Motion, Oskar Blues Brewery, Ben Phillips – Engel & Völkers Austin, Qualcomm, SPIbelt, ALVIES, FloTrack, Austin Sports Commission, FitRankings, Keep Austin Beautiful, Goodwill Central Texas, and Austin Massage Company. The Austin Marathon isn’t the only thing to look forward to race weekend. The 2018 Marathon Health & Fitness Expo will be loaded with exciting and runner-friendly vendors. Whether you need last-minute racing gear or want to learn more about the pacing team, the Austin Marathon expo has what you need. Now, if you want to be able to have your very own exhibition at one of our expos, then having a look at somewhere like John Gibson Display stands might be a good start for you to be able to get trade show ready, and this time next year, you could have a stand of our own at our expo. For now though, keep an eye out for can’t-miss items below when you visit the Austin Marathon expo on Feb. 16th (1:00 – 7:00 p.m.) or 17th (10:00 a.m. – 5:00 p.m.). Make sure the Austin Marathon doesn’t pass you by without purchasing some additional official Austin Marathon gear to commemorate your accomplishment. Leave the Austin Marathon expo with sweet gear and show up on race day decked out! Austin Marathon merch will be sold at the Health & Fitness Expo until it sells out. Be on the lookout when you’re at the Austin Marathon expo for the #RunAustin18 photo booth! Walk away with a memorable photo or GIF you can share on social media. Pics or GIFs or it didn’t happen. Need more? We’re giving away VIP experiences at this booth all weekend! At this year’s Austin Marathon, get the chance to interact with the pacers. Don’t miss your chance ask your pacer any questions you may have. There will be two pacers panels at the pacer lounge (by the Cigna Health: Friday, Feb. 16th (4:00 p.m.) and Saturday, Feb. 17th (12:30 p.m.). Clif Bar is our Official Nutrition. Get a chance to interact with some of your favorite brands. 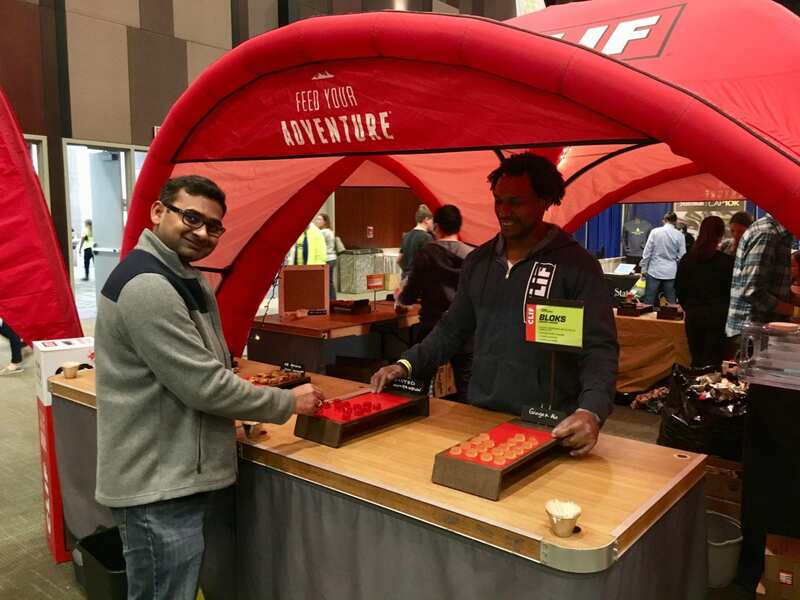 Clif Bar will be there to provide samples of everything from CLIF BLOKS to CLIF BARS. nuun will be there as well, supplying an array of electrolyte drink flavors. Try them all! Make sure you visit our good friends at Cap10K, Austin Massage Company, fitppl, Jack & Adam’s Fredericksburg, Motigo, Rookie Triathlon, SPIbelt, and all the other fantastic folks at the 2018 Austin Marathon Health & Wellness Expo! High Five Events is ready to showcase the revamped Austin Marathon® course. The race will begin at 7 a.m., feature a highly-competitive elite field, and be livestreamed by FloSports so spectators and loved ones around the globe can watch. Runners from all 50 states and 34 countries will run the 27th annual Austin Marathon on Sunday, Feb. 18th. 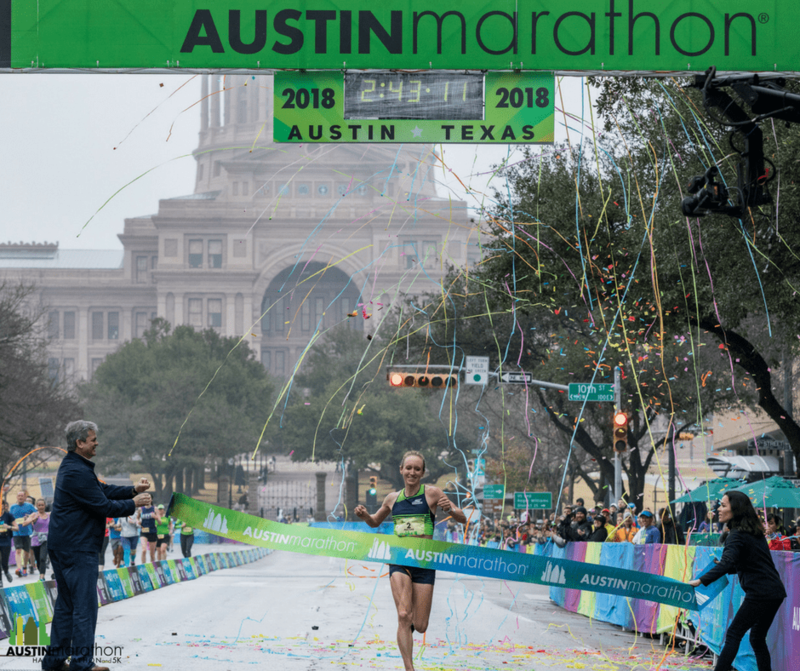 The new Austin Marathon course was designed to provide a better participant and spectator experience and allow enhanced traffic flow along the new marathon course, while still finishing with the picturesque Texas State Capitol as every runner’s backdrop. The first half of the Austin Marathon will remain unchanged. After Mile 12, half marathoners will head south to the finish line while marathoners continue east before turning north and running on Guadalupe St. through the heart of the University of Texas campus. The new marathon course will highlight Austin attractions like the University of Texas Tower and historic Hyde Park neighborhood, while taking marathoners on a tour of East Austin’s restaurants, murals, and landmarks. 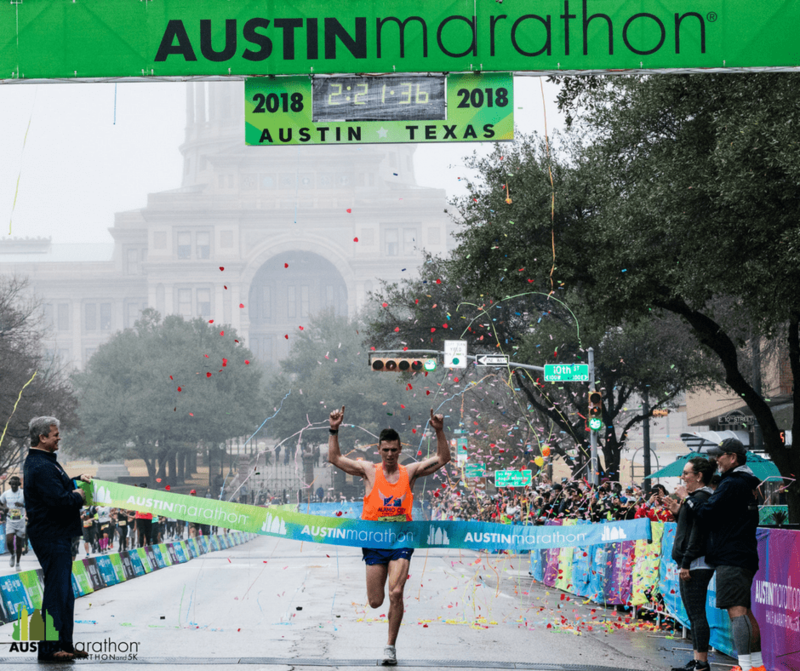 FloSports, a sports media based in Austin, Texas, will highlight the Austin Marathon and Half Marathon’s Elite Athlete Program by following the men’s and women’s elite leaders throughout the race. They will also have a camera capturing finishers as they cross the finish line. In addition to being available to watch online for free, the feed will be displayed on the finish line Jumbotrons. The following is a sample of the athletes in the Elite Field competing for the $20,000 prize purse: Allison Macsas (2016 Olympic Marathon Trials Qualifier), Craig Leon (2016 Olympic Trials Marathon Qualifier), David Fuentes (2016 Olympic Trials Marathon Qualifier), Becki Spellman (3-time Olympic Trials Marathon qualifier, 2008, 2012, 2016), Luke Humphrey (3-time Olympic Trials Marathon qualifier, 2008, 2012, 2016), Patrick Smyth (8th place 2016 Olympic Trials – 2:15:26), Allison Mendez-Cleaver (2016 Olympic Trials Marathon Qualifier), Amanda Scott (2-time Olympic Trials Marathon qualifier, 2012, 2016), Hillary Montgomery (2016 Olympic Trials Marathon Qualifier). The Austin Marathon will celebrate its 27th year running in the capital of Texas on February 18, 2018. Austin’s flagship running event annually attracts runners from all 50 states and 34 countries around the world. Having start and finish locations just a few blocks apart, being within walking distance of many downtown hotels and restaurants, and finishing in front of the picturesque Texas State Capitol makes the Austin Marathon the perfect running weekend destination. Participants can register for the marathon, half marathon, or 5K.